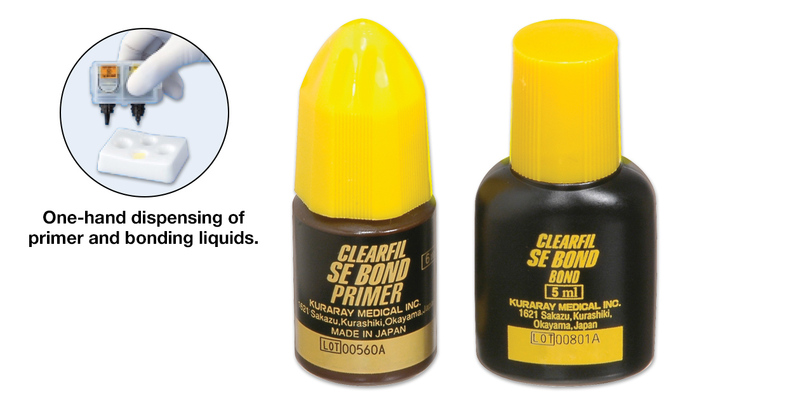 Clearfil SE Bond consists of two solutions: SE Primer accomplishes both etching and priming of dentin and cut enamel, and SE Bond, a 10% filled light-cured adhesive, completes the procedure. The two bottles are housed in a clear plastic container that allows single-handed loading of the liquids into a 4-well mixing dish, which is included. The SE Primer sets to a neutral pH after drying with a light air flow (no rinsing needed); surface preparation takes only 20 seconds. Then just apply the bonding agent, air-thin, and light cure for 10 seconds. Clearfil SE Bond earned 4.4 stars out of a possible 5.0. Very dependable – long track record. While its older sibling, Liner Bond 2V, has more impressive bond strength test results, SE Bond is simpler and easier to use. Its excellent clinical performance to date combined with its exceptional lab results makes it the gold standard for self-etchers. The unique dispenser allows you to handle both bottles with one hand. Squeezing the dispenser requires more pressure than is normally needed to express primers from the bottles. It can also be somewhat messy and asepsis is compromised. Its effectiveness with indirect restorations is mediocre and it does not bond to self-cured materials (without the help of an adhesion promoter). No unidose option. For conventional light-cured restorations, it's still tough to beat if you want to use a self-etcher.